Most of us know Roald Dahl’s timeless story of the world-famous candy man and his quest to find an heir. But it’s not everyday we get to watch it come to life in this stage adaptation of Charlie and the Chocolate Factory, which features the songs from the classic family film Willy Wonka and the Chocolate Factory at The Children’s Theatre of Cincinnati. Roald Dahl’s Willy Wonka JR. featuring a memorable score by Leslie Bricusse (Jekyll & Hyde, Doctor Dolittle) and Anthony Newley, follows enigmatic candy manufacturer Willy Wonka as he stages a contest by hiding five golden tickets in five of his scrumptious candy bars. Whoever comes up with these tickets will win a free tour of the Wonka factory, as well as a lifetime supply of candy. Four of the five winning children are insufferable brats: the fifth is a likeable young lad named Charlie Bucket who takes the tour in the company of his equally amiable grandfather. The children must learn to follow Mr. Wonka’s rules in the factory–or suffer the consequences. Bob Herzog, Local 12 News Anchor/Reporter and inventor of Dance Party Friday, will play Willy Wonka. I love this story anyway but Bob Herzog as Willy Wonka makes it so much more exciting! You can enter to win four tickets to this awesome play at Raising2tweens Facebook page. I have been divorced for more than a decade but converse with my ex-husband Troy several times a week since we have two children together. Our co-parenting relationship isn’t perfect but we do manage to make things work pretty well. We attend our children’s activities and sit together, go to team parties and even have meals together when an activity calls for it. People often ask me what our secret is. I’m not sure we have a specific secret but I’m willing to share what I do know. 1. Remember that your ex is either the mother or father of your child. This sounds obvious but so many people tend to forget this. No matter how upset I get with my ex, my children love him and he is an important part of their lives. Respecting that is important. 2. The way I treat my ex-husband teaches my kids how to treat others. I want my children to treat others with respect and learn to work out their differences. I can’t expect them to learn that if I’m constantly nasty to their dad. 3. Leave it in the courtroom or at mediation. There were times Troy and I would be in mediation screaming at each other or fighting tooth and nail over something important to us but we always left it there. We agree that fighting or discussing issues in front of the kids is off-limits. 4. Respect each other’s significant others. Many exes find entertainment in making fun of their ex’s significant other behind their back or by even being mean to them. I honestly have never understood why anyone would do this. This is another opportunity to teach your children how to treat others, as well as show them you can be the bigger person. The only thing I am ever concerned with regarding his girlfriend is how she treats my children. I am always very polite to his girlfriend and make a point to talk to her so she doesn’t feel uncomfortable around me. I also expect her to show me respect. 5. Keep each other informed. Troy and I make a point to tell each other things going on with the kids whether it’s about their grades, concerns, soccer practice, etc. That way we are both up to date on the important issues and there is no confusion. 6. Present a united front. If your ex reprimands the kids be sure to follow through with the punishment. You would want him to do the same for you. It also sends a message to the kids that they can pull one over on either of you. 7. Don’t make your child the messenger… no matter how old they are. 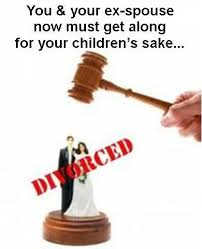 Your child does not want to be put in that situation and it’s likely to just tick off your ex. It’s much better for everyone if you just communicate with each other. 8. Don’t let your ex live rent-free in your head. I don’t allow myself to dwell or worry about things my ex has said or done. If I did, I would be bitter and it would come out in conversations between us causing us to argue. We got divorced for a reason… no need to let anything bother me now. I will admit we didn’t follow these eight steps the first year and it made for a very stressful time in our lives. We could barely look at each other without arguing and that wasn’t good for anyone, especially the kids. I quickly figured out that we needed to change our relationship. You don’t have to be best friends with your ex or even like them. Feel free to vent when you are out with your friends but don’t let it monopolize your night out. You just have to show them respect for the benefit of your children. And if you follow these eight steps, you will hopefully get along and make life a little less stressful for everyone involved. Do you find any of these tips helful? Do you have any tips to add?